The early versions of hearing aids relied entirely on equalization boost toward treble frequencies. We have already seen how poorly that works… but it is better than nothing. 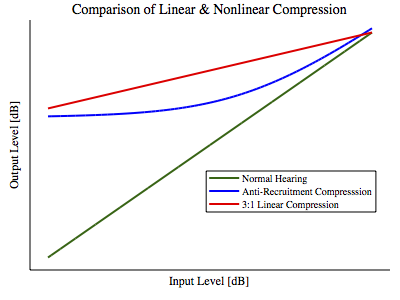 More recent versions began realizing the need for compression to squeeze the range of daily sounds into narrowed perceptual ranges caused by recruitment hearing. But that meant linear compression. In part it was the best they could do, since nobody really understood much about how hearing works. More recently, some companies have adopted multiple linear segment compression in each band, with up to 3 breakpoints along the curve. That tries to approximate an anti-recruitment curve. But then they left the arrangement of breakpoints and slopes up to the audiologist, with guidance from the hearing aid manufacturer’s database of patient studies. So Crescendo and physics comes along, and we have now orthogonalized the problem space so that we have reduced a 90+ variable problem into one needing only a single variable. People can make their own adjustments with a single knob. You don’t need to fiddle with 3 gain levels, breakpoints, and slopes across 15 or more bands. The fields of audiology and physics are like oil and water. Immiscible, ignorant of each other, and like so many other stratified domains, dismissive of each other. From physics, the world of hearing contains foreign elements from human anatomy and physiology, and the study of sound is so 19th century… not nearly as exciting as sub-atomic particle physics and cosmology. From the world of audiology: How can anyone believe that you could write an equation for hearing!? What a ridiculous notion. (I actually received that comment!) We overtly choose to rely on patient surveys from uninformed observers who rate hearing quality on a grade scale from A-F. Worse yet, it seems that technical information about hearing is intentionally withheld from the public by an apparent cartel of hearing aid manufacturers. I can’t honestly discern whether this is truly for reasons of greed, or from embarrassment about their state of knowledge. I say we need to blend the knowledge domains. And make the information and knowledge widely available. Patient studies are very crude and often misleading. Physics has much to offer, if it can be cajoled into looking here. I can’t claim ownership of this knowledge. I only happened to be in the right spot with the right background and motivation to look under the right rocks in the universe. The knowledge was there waiting to be discovered. It belongs to the universe and its inhabitants. But, armed with what I now know… I’ll describe how I get along in the world of humans speaking – in particular with my wife. I used hearing aids for several years. I got a pair of the very finest digital versions. And it cost dearly. But I found that I cannot wear hearing aids, or anything else inserted into my ear canals. Perhaps I’m more sensitive than most, but I end up with severe otitis infections. They have finally cleared up for me, after more than a decade of on/off suffering from them. I won’t go back to hearing aids. What I found instead is a personal amplifier made in Scandinavia, for $150. It claims to have DSP processing with 30 bands and compression with a 3:1 ratio, and treble EQ with up to 24 dB boost. (don’t be fooled, those 30 bands are from an FFT, constant bandwidth and not matched to human hearing as Bark channels are.) It fits in my shirt pocket, and runs for several weeks on a pair of AA batteries. I’m not vain. You see how ridiculous that would be for listening to music? It would overcorrect at nearly every presentation level, exactly the kind of thing that turns oboes into muted jazz trumpets. I don’t use it this way. And I don’t use it for listening to music. And I would never just insert the stereo line-in plug from any music source. Much better, eh? Still nowhere near good enough for music, but just fine for speech, and at least not horribly offensive when music appears in the background. The cost at $150 is reasonable, compared to the $7,000 I paid for my digital hearing aids. 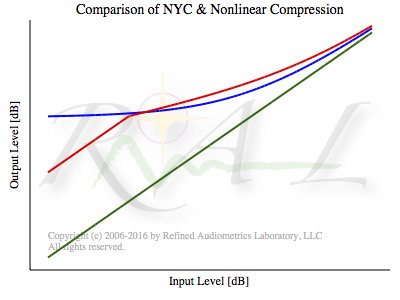 And it works much better because I’m in control and I’m forcing it to become the NYC variant of compression by using the open ear / direct sound combination. But mostly, when my wife isn’t around, or I don’t have to be in a meeting with someone, I just use nothing. I like the quiet that my deafness provides. I need it to be able to think deeply.